Do you live in Walthamstow and want to get rid of the building materials, spare room clutter or old thee-piece-suite driving you up the wall? You have come to the right place. As fully licensed and insured waste removal experts we are the only firm to consider for Walthamstow skip hire. There’s no need to worry when it comes to space, access, or permit issues when it comes to skip hire with Away With It, we have everything handled. With so many skip hire and waste removal companies around, how to do you know Away With It are the best in the business? Our reputation for impeccable customer service precedes us and we pride ourselves on being the friendliest, most flexible and most efficient skip hire firms in the country. Our two different waste removal services offer different perks but will definitely save you time and money based upon your requirements. On the one hand we offer traditional skip hire. This is when we drop an empty skip off to your home for a designated period of time and you are welcome to fill it at your own pace. We will then retrieve the skip and your waste is gone! 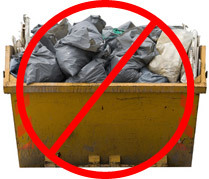 Another popular solution from us, however, is our two-man waste removal teams. Our experts will load their licensed company vehicle with your waste without you having to lift a finger. It really is as simple as that. They will make sure your property is perfect upon leaving and clean up after themselves. Don’t worry if you are confused about which option is best for you. When you give us a ring we will take your through all the fantastic options available, so that you can make an informed decision that suits your scenario and budget. Why Choose Away With it for Walthamstow Skip Hire? Reliability and flexibility are some of the central buzzwords of how Away With It operates. Over the years it is what has seen our customers come back to us time and time again. With us it is all about you as we know you are busy and need efficient service. Communicating with us couldn’t be easier, we are always on the end of a phone and ready to discuss any requirements you have. Upon deciding the best service for you, we will provide you with a guaranteed two-hour slot. However, as a courtesy to you, our teams will always give you a call letting you know they are on their way to your property. We are open 7 days per week between 7am and 11:30pm. Our opening hours are extended compared to other companies so that customers can pick times to suit their needs, many of which need to be outside of their working hours. You can also rest assured that any waste removed from your property, whether it be by skip or waste removal team, will be dealt with professionally. Not only are we fully licensed and insured, we also have a green approach to what we did, recycling 80% of everything we remove. Sounds ideal, right? Want to know how to make the next step? Simply give us a call today to talk through your options and receive a no-obligation free quote. No pressure to say yes there and then, please go away and think about it. You are more than welcome to get back to us with any questions you have though. That’s what we are here for. Call 0208 504 7390 today and find out all about Walthamstow skip hire solutions.